The Spider returns with a Spearhead of 6 Talos against a Ulthwe force led by Eldrad! 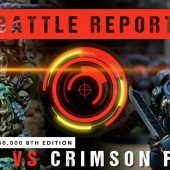 The Blood Angels make a furious return against the Iron Warriors! An all new Grey Knights dual Battalion list is pitted against the blood thirsty forces of Khorne! Beard takes a mixed Imperium list in his first Tactica against Bone and a deadly Kraken force. Calgar heads up a Primaris force of Ultramarines against a Sa’Cea Sept T’au army! 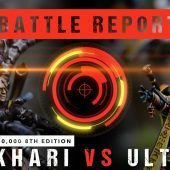 In this furious Battle Report, brother faces brother as Magnus takes to the field against Mortarion! The Grey Knights return with a host of Terminators to face off against the insidious Genestealer Cult! The Spider takes the helm of the new Studio Primaris army to take on Hive Fleet Myrmidon!